Breeden also has several other apartment projects under construction or in the works across the state. In July, the company broke ground on Harbor Vista at Crawford Street on Portsmouth’s waterfront. The five-story, $17 million project is scheduled be ready by the summer 2016. The community will offer a roof deck lounge that overlooks the marina. Breeden also plans a community at the North Pier site in Portsmouth that’s adjacent to the nTelos Pavilion. Harbor Vista is one of several additions to the Breeden Co.’s Enriched Lifestyle brand planned for 2015. The MARQ. 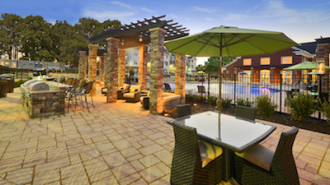 in Virginia Beach (264 units), The Village at Westlake in Richmond (252 units) and Eagle Harbor West in Carrollton (208 units) are all scheduled to break ground in 2015. Aqua on 25th Street in Virginia Beach (147 units) and Parkside at Charles Street in Newport News (148 units) broke ground in January. The projects total more than 1,100 units. Breeden Construction will serve as the general contractor on the projects.